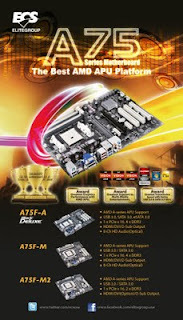 ECS has launched A75 series motherboards which include Black Deluxe A75F-A, A75F-M and A75F-M2. ECS A75 series motherboards based on the latest AMD A75 chipset supporting AMD Vision APU are ready for high-performance graphics computing. For example, ECS A75 series motherboards with the latest A8 APU which contains 8 cores and ATI HD 6650D graphics power could all achieve the A level Performance of Street Fight IV and averagely over 9900 points. Accelerated Processing Unit (APU), the whole new concept of combining CPU and GPU together presents strong power on graphics computing with multi-tasking computing ability. ECS has amazed the market with ECS HDC series with AMD dual-core processors E-350 or single-core processor E-240 APU on board. Now, ECS continually presents A75 series motherboards to greet the new era of APU. ECS A75 series motherboards equip with USB 3.0, SATA 6 Gb/s and eSATA 6 Gb/s natively supported by A75 chipset. Of course, all A75 series motherboards have multi-output for its famous graphics power. All ECS A75 series motherboards are ready for DirectX® 11 and UVD 3. ECS Black Deluxe A75F-A even passes the super burn test with 50℃ to make sure the quality and steady. With extreme data transmission speed equipments, powerful graphics performance, and elegant layout design, ECS A75 series motherboards are ready to sweep across the market as the best APU platforms. Visit www.ecsusa.com for more information.